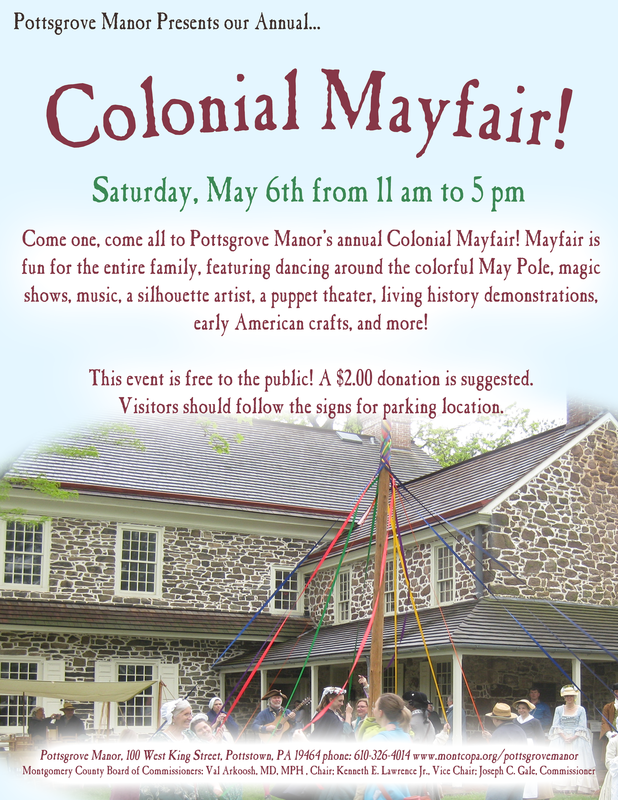 Pottstown, Pennsylvania – Celebrate spring at the Annual Colonial May Fair held at historic Pottsgrove Manor on Saturday, May 5th from 11:00am to 5:00pm. This yearly event is a fun-filled day with activities for all ages—games, music, dancing, and crafts. New to the fair this year is colonial conjurer Levram the Great, who will perform colonial magic shows and entertain visitors with pocket magic tricks throughout the day. Tuckers’ Tales Puppet Theatre returns again this year to perform the puppet shows St. George and the Dragon and their brand-new adaptation of the classic Cinderella. They will also provide festive historic music around the grounds during the event. Members of the Tapestry Historic Dance Ensemble will demonstrate authentic country dances and will lead visitors in dances around the Maypole to open and close the fair. In addition to the entertainment, a variety of Early American crafters and demonstrators will be on hand to display historic skills and trades and sell their wares. Young visitors can compete in hoop races, play with colonial toys and games, help churn butter, and more! The first floor of colonial ironmaster John Potts’ 1752 manor house will be open for self-guided tours during the fair. Historic foodways expert Deborah Peterson of Deborah Peterson’s Pantry will be demonstrating open-hearth cooking in the Pottsgrove Manor kitchen. Visitors can also shop at the Manor’s museum shop for colonial games, books, and unique gifts. While visitors can’t try the food cooked in the colonial kitchen, they will be able to purchase food during the event, including a variety of tasty baked goods from the Milkman Lunch Co. and Cake Shoppe of Pottstown. A donation of $2 per person is suggested for this event. Visitors are asked to park at the Carousel at Pottstown building, 30 West King Street. Visitors can also stop in to the Carousel and see the progress that is being made there. 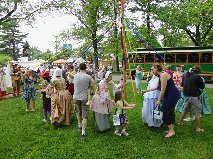 Pottstown’s restored trolley will be giving FREE rides during the fair between the “First Saturday” activities downtown, the Carousel at Pottstown, and Pottsgrove Manor. Handicapped parking is available in the museum’s parking lot. Pottstown Manor is located at 100 West King Street near the intersection of King Street and Route 100, just off Route 422, in Pottstown, Pennsylvania. 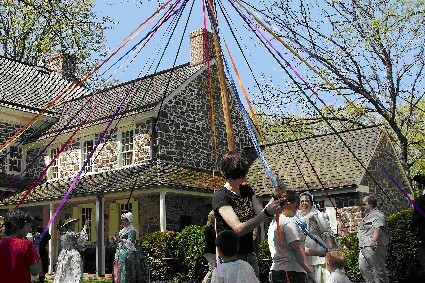 Pottsgrove Manor is operated by Montgomery County under the direction of the Parks and Heritage Services Department. For more information, call 610.326.4014, or visit us on the web at http://historicsites.montcopa.org/pottsgrovemanor.